Automated Heat Treat Furnace with Manipulator. Tip-up batch furnaces, used by the aerospace industry in the heat treating of titanium and nickel alloy forgings. Built in 1997, this automated heat treat system include a quench tank in the floor, with a manipulator in front of each furnace. Visit our photo gallery for more Automation and Material Handling Systems photos. 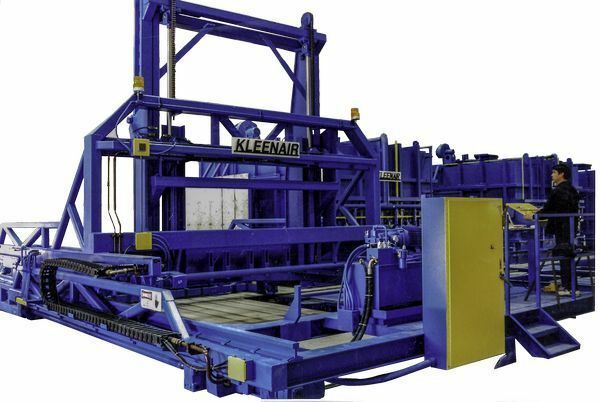 Kleenair Products Co. designs and manufactures automated material handling systems for use with our industrial furnaces, batch furnaces, and continuous furnaces. We provide customized automation and robotics solutions for loading and unloading parts and materials, as well as for more specialized operations like quenching and forging. Our engineering team will work with you to develop a customized material handling system that is tailored to your unique part, process, and production requirements. We can provide complete automation systems that can execute complex, multi-step processes. Kleenair can engineer an automated system that performs all the material handling operations your process requires. Contact us today to discuss your automation requirements. All of our automated systems are designed to meet the highest safety and quality standards. 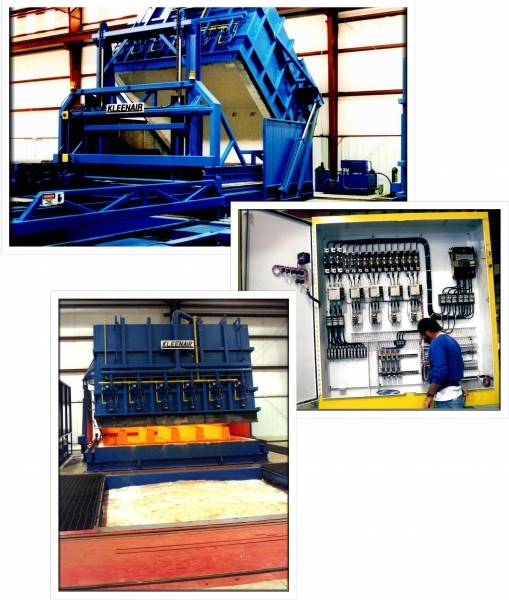 We also provide parts and services for our automated material handling systems. Our automation solutions can be customized to your unique needs and are easily incorporated into our furnaces and ovens, with advanced HMIs for superior ease of use in even the most complex processes. We can provide the following material handling systems and much more. Automated manipulators, capable of lifting and transferring heavy loads. Kleenair can also provide standard (non-custom) robotic material handlers from top manufacturers such as Fanuc and Siemens. If they provide the performance and capabilities your application requires, these “off the shelf” automated systems can be an ideal material handling solution. Third party robotics and automation can be seamless integrated into our furnaces and ovens, with all automation and system controls incorporated into a single, easy-to-use interface. Kleenair Products’ automated technology provides greater productivity, product consistency, and operator safety. Request a quote for an continuous or batch oven with automated material handling systems, or contact us to discuss your furnace and automation requirements.